The Dodge Charger was first introduced in 1966. The grille and front fascia were different from many other Dodge models, but it was certainly a recognizable Dodge vehicle in its first generation. Now, more than 50 years later and in its seventh generation, the Dodge Charger is a much different vehicle. A new look, now four doors, side scoops along the doors, angular headlights, and a new grille, this seventh generation Charger first hit the streets in 2011 and it was powered by a 3.5-liter V6. When Dodge added three V8 engine options, two of which are SRT engines, to the Charger lineup in 2015, a lot changed. There are now four engines options available on the Dodge Charger – a 3.6-liter V6, 5.7-liter HEMI V8 engine, 6.4-liter HEMI V8, and a supercharged 6.2-liter HEMI SRT Hellcat V8 engine. It goes without saying that the SRT Hellcat V8 engine is indeed under the hood of the Dodge Charger SRT Hellcat. Along with an assortment of performance parts, the Dodge Charger became the fastest sedan in the world. Built like Chrysler’s 6.4-liter and 5.7-liter HEMI engines, integrated with charge coolers to cool the air compressed by the supercharger, the supercharged 6.2-liter HEMI SRT Hellcat V8 engine has a boost of 11.6 PSI. Able to generate 707 horsepower and 650 lb-ft of torque, it has a top speed of 204.55 mph. 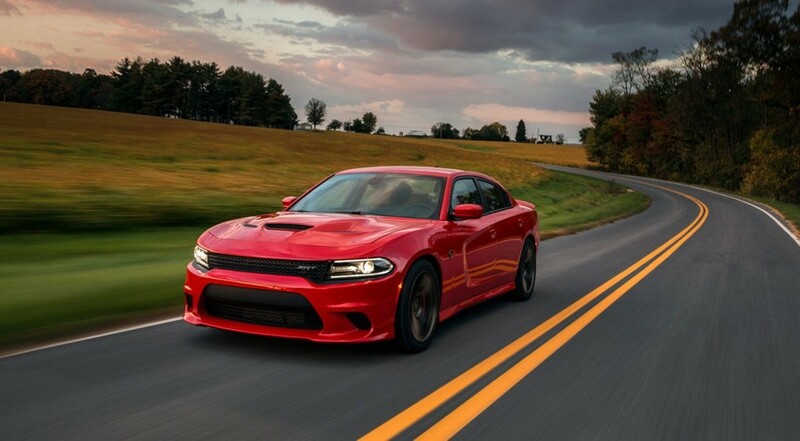 Being the fastest sedan produced, the Dodge Charger accelerates from 0-60 mph in 3.4 seconds and can finish a quarter mile in just 11.0 seconds. Surprisingly enough, all that power and it still gets 22 mpg on the highway. To bring this sedan to a stop, ultra-high performance brakes by Brembo with ABS make up its braking system. To make the ride as smooth as ever, the Dodge Charger SRT Hellcat rides on low gloss black 20-inch lightweight 5Deep 5-spoke Aluminum Wheels. Other performance parts consist of a dedicated cold air intake and dual air extractors have been integrated into the hood. The exterior of the Dodge Charger SRT Hellcat separates it from the rest of the lineup. It’s not just the badges and decals such as the SRT Design Badge, SRT Hellcat Exterior Badges, and SRT Nameplate Badge. It’s also got the heritage and iconic styling with its crosshair grille, performance hood, and optional dual carbon stripes. Being the high-end of the Dodge Charger lineup, the Charger SRT Hellcat trim has plenty of goods. Standard features consist of automatic headlamps, bi-function HID headlamps, acoustic front door glass and windshield, black headlamps bezels, dual bright exhaust tips, a dual rear exhaust, heated exterior mirrors with blind-spot indicators, solar control glass, and keyless entry. The Dodge Charger SRT Hellcat is also available in thirteen colors, including HIP Legacy colors, such as TorRed and Go Mango! Able to seat five passengers, all of the seats in the Dodge Charger SRT Hellcat are heated, and the front seats are also ventilated. The upholstery is leather and a Laguna Lux Perform SRT Logo is embossed into the material. 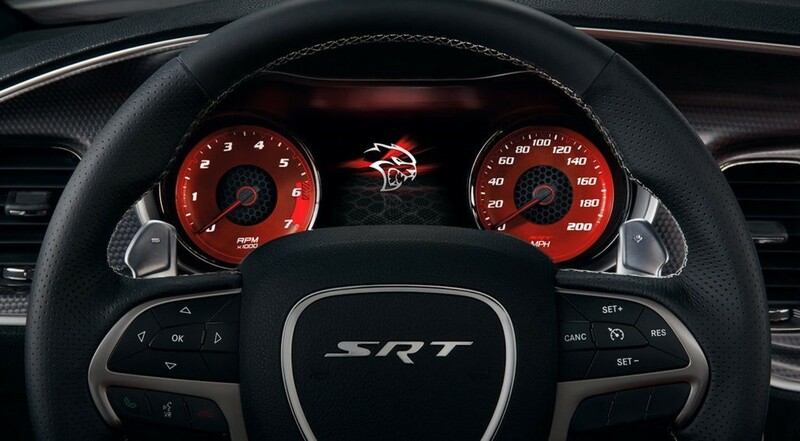 A backlit SRT badge is on the steering wheel and glows red while the automobile is on. Many convenient and comfort features can also be found in the Charger SRT Hellcat. These features consist of automatic dual-zone temperature control, front and rear solar control glass, a heated steering wheel, a leather wrapped shift knob, Bluetooth with voice command, a media hub, a steering wheel mounted shift controls, and LED interior lighting. The interior is available in black, a black/ruby red combination, and a black/sepia combination. Six premium speakers make up the sound system with Uconnect 8.4 on an 8.4-inch touchscreen display, Apple CarPlay, and Google Android Auto. This is the next generation of Uconnect and it seamlessly integrates with a user’s smartphone. Audio controls have been mounted onto the steering wheel, and GPS navigation has been integrated into the system. The Dodge Charger SRT Hellcat has many safety features, such as an advanced multi-stage airbag system, active head restraints, blind spot and cross path detection, a ParkSense rear park assist system, a ParkView rear back-up camera, child seat anchors, a Sentry Key Theft deterrent system, and a security alarm. Pricing for the 2017 Dodge Charger SRT Hellcat starts at an MSRP of $67,645. Dodge vehicles are covered by a basic 3-year or 36,000-mile warranty, powertrain 5-year or 60,000-mile warranty, rust-through Coverage for 5 years or 100,000 miles, and roadside assistance for 5 years or 100,000 miles.